Fresh from his winner against Manchester City, Frank Lampard has revealed he is frustrated with life as a substitute. The Blues took the three points through an 82nd-minute penalty from substitute Lampard. The England international believes he is in form and is as fit as ever, and cannot understand why he is not starting matches. 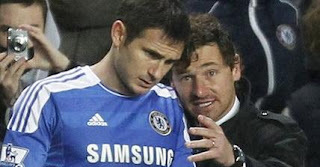 "I want to play, simple as that," Lampard said. "I'm as fit as I've ever been. I've been in a good run of form and now I've not been playing. I haven't spoken (to Villas-Boas) so I don't know (why), simple as that." The 33-year-old has started just 16 of Chelsea’s 24 games this season, with the win over City the second match in succession he had began on the bench.